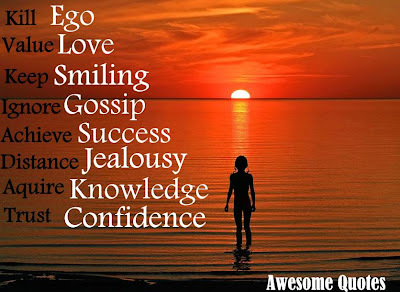 Awesome Quotes: Ego kill it, Love value it, Smile keep it, Gossip ignore it, Success achieve it, Jealousy distance it, Knowledge acquire it, Confidence trust it. Ego kill it, Love value it, Smile keep it, Gossip ignore it, Success achieve it, Jealousy distance it, Knowledge acquire it, Confidence trust it. Keep smiling and hargai kasih sayang!